【60S Heats Up】There\'s not a long wait when you\'re in a rush. Wrinkles disappear nicely when you\'re steaming a more light-weight fabric. 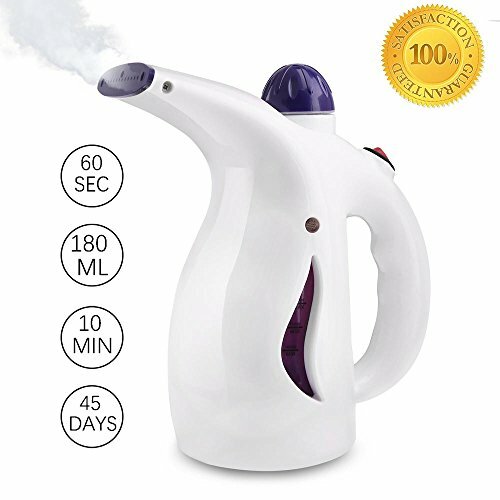 The 200ml water reservoir (200ml Volume) allows you to go on steaming for 10 straight minutes. 【Compact Design】This steam iron shows a real light weight, compact design. Packing it in your luggage and carrying it everywhere. 【Safety Protection】Visual water tank,power overload protection and over temperature protection:It can protect you aviod machine damage caused by unstable current and lack of water. 【Steam Face & Iron Clothes Dual Function】Three button are free to switch?Steam face,iron clothes and power off switch.High temperature brush help you clean the clothes. 【Warranty】45 day money back and 12-month manufacturer\'s warranty.With nothing to worry about, try it today!